In late September we started to notice that stocks that were reporting earnings were falling sharply in reaction to the news. This did not portend well for the upcoming earnings season that begins this week. We viewed the share-price weakness for stocks that reported earnings in September as a sign of things to come. Given how weak equities have been so far in October, it appears that the market took notice of the earnings weakness in September as well. We’ve seen a sharp sell-off in stocks — particularly growth stocks that are volatile on earnings — ahead of their upcoming report dates, which suggests to us that the market is pricing in earnings weakness. For bulls, the hope now is that the re-pricing of shares to much lower levels ahead of earnings has actually gone a bit overboard. Below is our regularly updated list of the most volatile stocks on earnings. To make the list, a stock must trade for more than $5/share and have at least 10 quarterly reports in our Earnings Screener database. 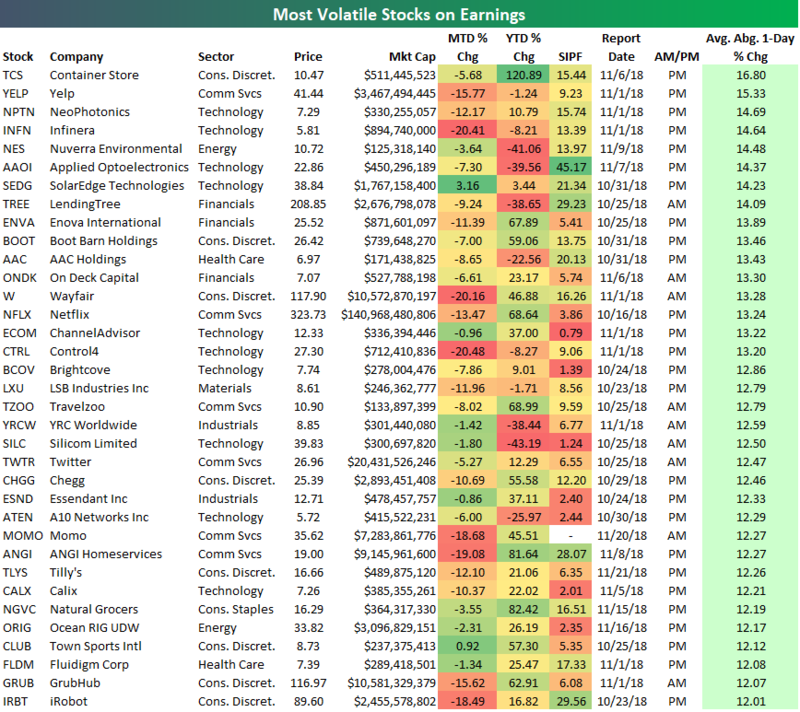 The 35 stocks below all average a move of at least +/-12% on their earnings reaction days, so you can expect big volatility when they report in the upcoming weeks and months. We mentioned above that stocks have been selling off sharply ahead of their earnings reports this season. Well, the 35 stocks in the table below have averaged a decline of 9% so far this month! We’d call that a pretty sharp sell-off, and it shows just how spooked investors are ahead of this earnings season. Again, the only hope for investors now is that the selling has been exhausted, which should lead to gains when the actual earnings news event occurs. The Container Store (TCS) is the most volatile stock on earnings with an average absolute one-day change of 16.8%. Yelp (YELP) ranks second, followed by NeoPhotonics (NPTN) and Infinera (INFN). Other notables on the list include Wayfair (W), Netflix (NFLX), Travelzoo (TZOO), Twitter (TWTR), GrubHub (GRUB), and iRobot (IRBT). For each stock, we also include its MTD and YTD change along with its short interest as a percentage of float. Stocks that have gotten crushed and have high short interest levels are the most ripe for a big upside move provided the earnings are decent when they’re released in the coming weeks. Stocks that haven’t fallen very much recently that have low short interest levels are the most ripe for a big sell-off in reaction to earnings should the numbers not impress. Start a two-week free trial to Bespoke Institutional to use our popular Earnings Screener tool.